As part of my ongoing clean up and clear out of things around the house, I have been sorting through lots of my crafting materials. I much prefer to regift these to friends than just throw them out, so I did a bit of a call to find out who was interested in various things. I managed to give some magazines to my friend Rhi that I hope she or her sister Tanith find useful – in addition to the papercrafts I bought them for, these magazines also had knitting, crochet, sewing, glass painting and various other articles and patterns. I tried some of the glass painting ones a while back, and it was fun but I wasn’t particularly good at it. I still have the glass paints and I can try it again, but that in itself was not enough for me to keep the magazines, so I hope that they are fun and useful in their new home, or that Rhi can pass them on to someone else. My friend Emma-in-Perth has two young daughters, and had expressed an interest in anything that had crafting for kids. I managed to find some articles on that, so set those mags aside, and then also went through some others that had some very basic articles that I thought she might be able to adapt. Emma’s style is quite like mine – vintage, shabby chic, similar colour palette. So perhaps she can use these for different ideas for the girls. I also had set aside some of the ‘freebies’ – sample products that come with the magazines – that I thought would appeal to young girls, and which as nice as they are I knew I would never use. There were several stamp sets (including one with two little girl stamps and one set with cakes and sweet treats), plus a Christmas stamp set after Emma said she was going to make Christmas cards with them. Then I started to get ruthless. I went through my paper collections and pulled out papers that have been there for a while that were bright and colourful and would appeal to children. I included stickers, particularly bright ones (one set of bugs and flowers I really liked, but I had had them for 5 years and not used them, so onto the pile they went too!). Plus packets of dried flowers and leaves I got from a work colleague, and so on. If I hadn’t used it in the past 2 years, and I thought it would appeal to a child, then I included it on the pile. In the end it was quite a large box including the magazines, and I was very pleased to sent it off. Emma is a lovely person who does things like finds spare copies of out of print books in second hand stores, on the off chance someone might like it, and has sent me books I was after that way. So I was really happy to share crafting materials I have no need for with her girls, and that also means she can keep her good papers and stamps separate (because I am sure no matter how well they mean, something might get wet or inky or damaged otherwise). So they have their own craft supplies now. What I did not expect was for the girls to do me some artwork as a thank you, and to get a thank you card from Emma too. I was so excited to receive it! And then I realised that I had nowhere to display it. I don’t really have any of my own work up, except for a few mixed media canvases in a corner on mini easels. So I took myself off to Officeworks, got a corkboard, some coloured magnetic mini whiteboard panels, and some 3M sticky things, and set myself up with a craft display wall in the living room. 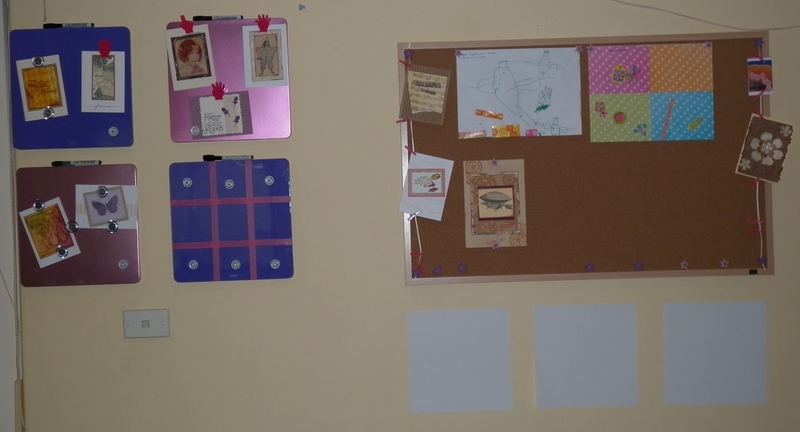 On the left: Four magnetic whiteboard panels, alternating colours. Top left is samples of Christmas cards from past years. Top right is various cards I have made while experimenting and decided to keep. Lower left is cards I made for someone who then didn’t want them and I put them in my sample folder. 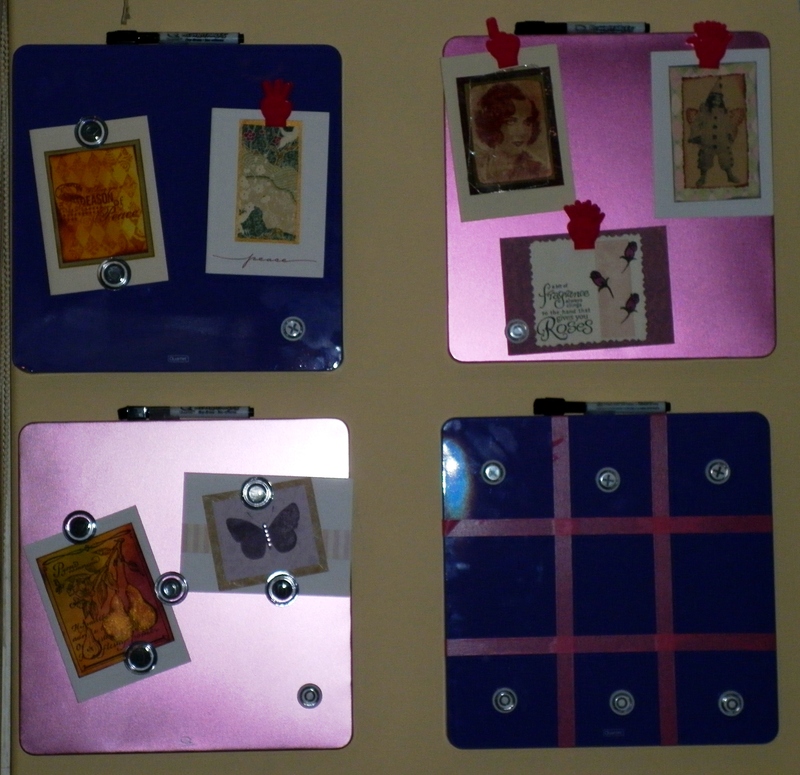 Lower right is turned into a Noughts and Crosses board using pink washi tape and with X and O magnets. I can change these items easily, they are held in place by magnets. On the right: I have two beautiful pieces of artwork by Emma’s daughters in the centre at the top, a thank-you card and another card from Emma, one on each side. Plus a few of my own cards on the corkboard, including the Tattered Flowers card and the Steampunk Airship card I made earlier this year. The display in the centre has the items pinned, while those on the side a pegged with mini pink pegs to cream cord I added down each side. 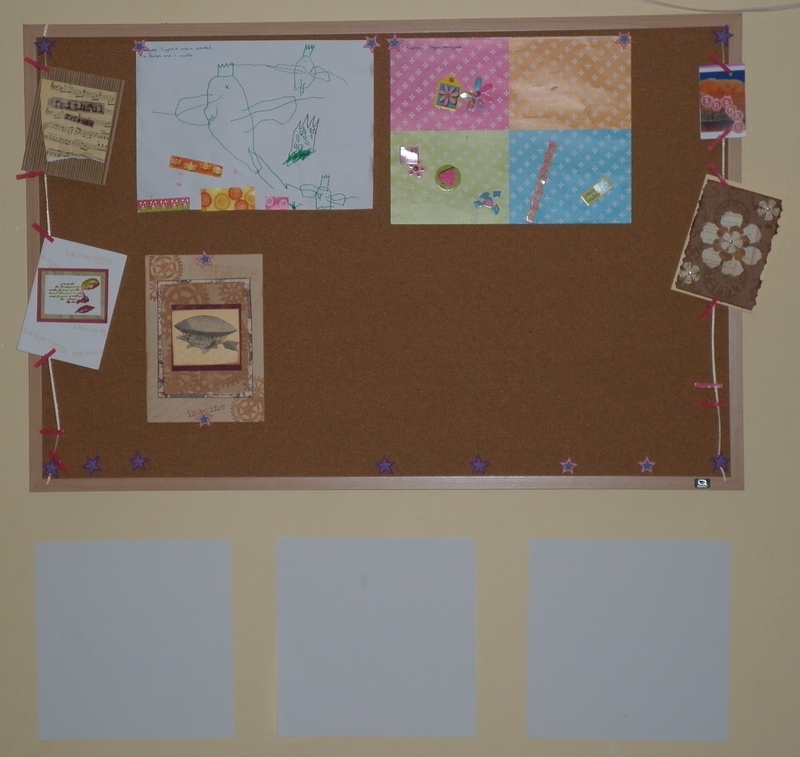 The white squares beneath the corkboard are stick-on whiteboard panels, in case I get ideas and want to scribble things down – art supply shopping lists, who to send cards to (birthdays, Christmas, weddings or whatever), or any ideas I might have about what to make. I thought having a display in an area where I can regularly see it might get the creative ideas flowing and inspire me to jot things down when I think of them. That is the plan anyway! It took some experimenting to get it all up, but so far none of it has fallen down, and everything has stayed in place for a few weeks now. Fingers crossed that it all gets through the heat of summer ok. Thank you! The girls have been doing a lot of stamping and stickering, nearly every day. Nice to see their art up at your place!